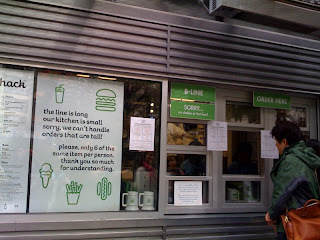 Shake Shack has had an obsessive following in New York City since its opening in 2004. This all-American food stand is so popular and the lines are so ridiculously long that Shake Shack had to incorporate a webcam on their website (check it out on their home page) to allow people to see how long the current line is in real time. (When I visited their webcam at 3:00 pm today just for the hell of it, I saw that the line was still out of the park, literally). Surely, this must be a sign of something special about this place, in a city of 18,696 restaurants. And New Yorkers are fast on their feet, so the fact that many of them will plant their feet in one location for an hour to get one burger or one frozen custard was reason enough for us to spend our holiday at this amusing site. 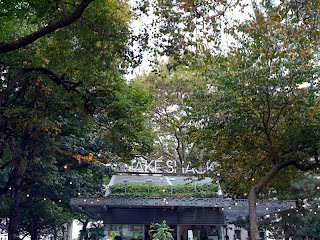 The Shake Shack is a diner-looking "roadside" food stand in Madison Square Park (southeast corner of Madison Avenue at 23rd St.), powered by wind energy, that's famous for its burgers and frozen custards. It can't be called "fast food" because it 'aint fast by any means. From March through October, they're open daily from 11 am to 11 pm, from November through February, they close at 7 pm. When we went today before 11:00 am, we completely lucked out because the line wasn't too long. I think the key is to go either really early, really late, or go when the weather is really bad (the lines during the summer months supposedly can keep you waiting for upwards of two hours). Still, it seemed we had sheer luck on our side, or maybe people slept in late today from a long night of partying. Thank goodness, we're almost at the magic window . . . it made us wonder . . . perhaps it's a scheme . . . to keep people waiting so long in anticipation of the burgers that even if the burgers were crappy, people would think it tasted good out of pure hunger. Hmmm . . . But we only had to stand in line for about 15 minutes, then waited another 15 minutes for our food. 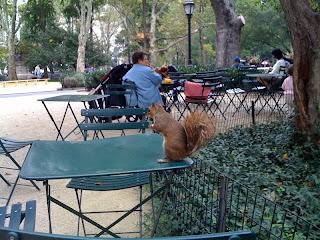 You take a buzzer back to one of the very clean park cafe-style tables and watch the hungry jumpy squirrels as you kill time. 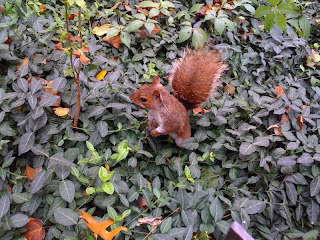 We saw one squirrel pigging out on one of the Shake Shack fries. The verdict is in . . . it's not a evil scheme . 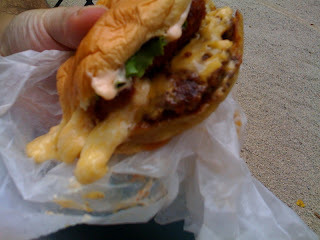 . . this was one of the most delicious burgers we've ever given our mouths the joy of experiencing. Everything lived up to its reputation. Their burgers are ground daily, cooked medium (which we love), and made to order. 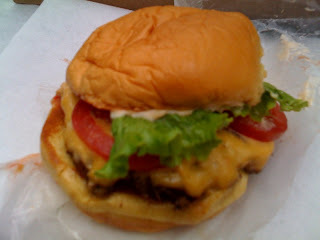 We ordered their ShackBurger single for $4.75 (with American cheese, lettuce, tomato, and their special Shack Sauce). Sometimes the best burgers are the simplest ones. The meat was juicy, tender, succulent, the bread was perfectly soft (no part of the bread was crumbling), like a sweet bread without the sweet, and the Shack sauce was so good that we barely dipped the burger in ketchup. We found our "happy place" with this one. And woah woah woah! 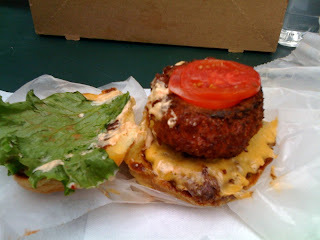 This is Shake Shack's Double Stack for $8.50 (cheeseburger and a 'shroom burger topped with lettuce, tomato, and Shack sauce). And look at the cheese oozing out of the Double Stack. These french fries were out of this world! Perfect. The best fries we've ever tasted. Soggy-proof. Perfectly golden crisp. Only $2.75 and 100% free of artificial trans-fat. If we knew how good these fries were going to be, we would have gotten two orders. We loved them but we weren't insane enough to stand back in line for them (as we were eating we saw the line getting longer every minute). 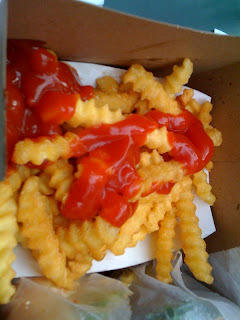 The Shake Shack fries have spoiled and ruined us from being happy with other fries. We also wanted to try their frozen custards because in addition to the burgers, the Shake Shack received legendary status because of their frozen treats. 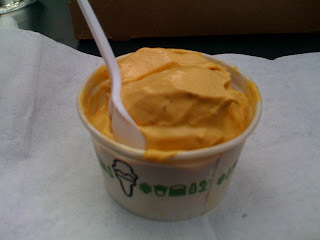 Today's custard of the day was "Pumpkin Spice." It tasted like they just cut up a pumpkin right then and there and mixed it up with the best frozen vanilla ice cream on this planet. Their October custard calendar also includes Apple Rosemary, German Chocolate, Pancake, and Shack Shiraz Poached Pear. You can order them in a cone, or a cup more suitable for messy people like us. Their other menu items are brilliant, which includes the enormous Shake Stack (two cheeseburgers and a 'shroom burger) and four different types of hot dogs. Their desserts include frozen custards like the black & white hand-spun shake, Purple cow float, and the Concrete jungle (dense frozen custard of hot fudge, bananas, and peanut butter). You can even order beer and wine at all hours of the day here (brown bag not necessary). 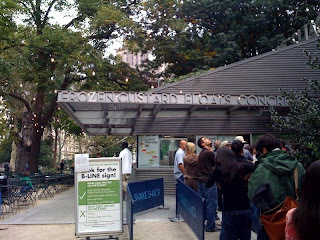 And since New York City, is such a dog-loving city (seriously, it seems everyone here owns dogs and treats them better than they treat themselves), the Shake Shack offers the Pooch-ini, a chilly treat for your dog consisting of vanilla custard, peanut butter and dog biscuit. 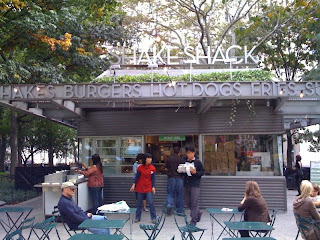 We're really glad we waited until the Fall to experience the Shake Shack. 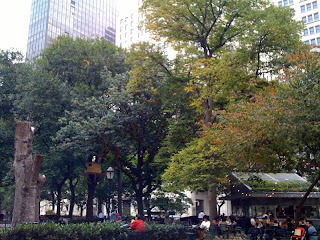 Eating at Madison Square Park in the Fall, beneath the trees as the leaves are beginning to change into its beautiful orange, yellow, and red colors, is really beautiful. It's not sticky like the summer, it's not freezing cold or wet like the winters, it's just cool and wearing a light jacket is sufficient. 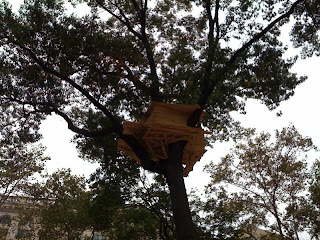 Madison Square Park also currently has tree huts in several trees created by Japanese-born artist Tadashi Kawamata dispersed throughout the park. 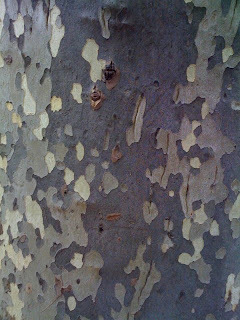 The trees here are beautiful. Enlarge this picture. 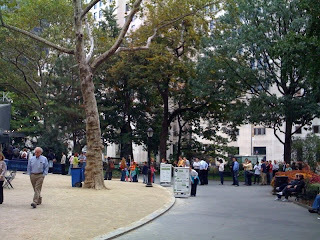 This is what the line at the Shake Shack looked like when we were leaving around 12:15 pm. The lines will always be long at any hour of the day, but never go during the prime lunch or dinner hours, especially when the weather is good like it was today, unless you're lonely and don't mind being surrounded by anxious cranky people. The bad thing is now that we're hooked on their burger, fries, and frozen custard, we're gonna want to to back, and so we will then have to join the "Shake Shack Webcam Freaks" group. Maybe we'll wait until the dead of winter when the lines (might) die down.